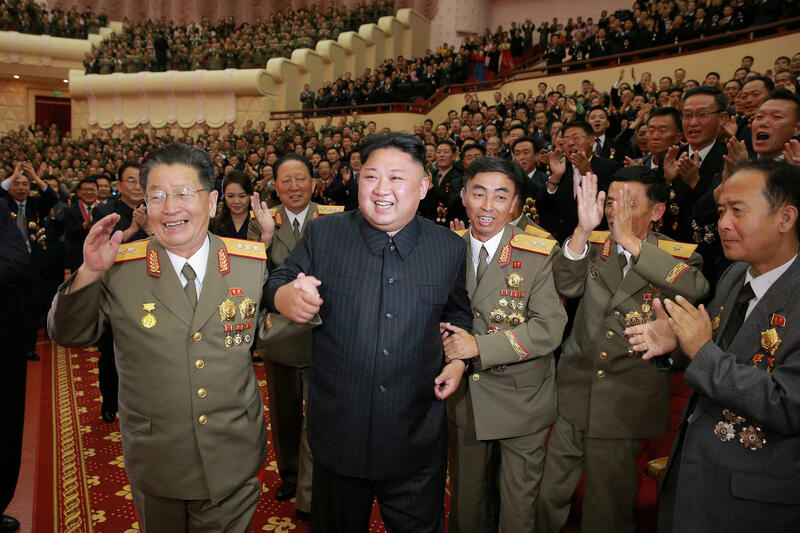 North Korean leader Kim Jong Un at a celebration for scientists and engineers who contributed to the nation's latest nuclear test. Now, new research shared exclusively with NPR shows one way the North may have been able to develop these technologies despite the global blockade. An analysis published Wednesday by the Middlebury Institute of International Studies at Monterey of North Korean studies in scientific journals suggests Pyongyang is circumventing the sanctions regime through open research collaborations with other countries. Of the 1,304 papers they analyzed, about half, researchers believe, could have direct or indirect military applications. About 100 are "of concern" — meaning they need a close look. Most of the papers, 913 in total, are collaborations with Chinese scientists. A small fraction of those papers include additional co-authors of other nationalities. The knowledge gained from some of these collaborations may be helping the North to obtain and refine weapons technologies it is not supposed to have, says Joshua Pollack, a scholar at the Middlebury Institute who co-authored the analysis along with independent researcher Scott LaFoy. "This is in part how the North Koreans go about beating sanctions," Pollack says. The revelation comes at a critical time for the United States. At a summit in Singapore earlier this year, President Trump and North Korean leader Kim Jong Un pledged to work toward "complete denuclearization of the Korean Peninsula." But the two sides cannot agree on the first steps. The Trump administration is counting on a pressure campaign of sanctions to push North Korea into dismantling its nuclear capabilities. Science is revered by the North Korean state. Scientists in the communist nation are given new high-rise apartments and are praised in speeches by Kim, according to Kee Park, a neurosurgeon at Harvard Medical School who has traveled numerous times to North Korea. "The North Korean regime regards their scientists as a valuable asset for many reasons," he says. Park has seen firsthand just how valuable science can be to the isolated nation. North Korean medical researchers often have outdated equipment and scant resources. But they have developed and manufactured their own ultrasound machines, built a medical CT scanner from scratch, and more. "They're now manufacturing their own artificial knee implants and they're implanting them on their own patients, which to me is remarkable," Park says. Park says he thinks research like this is designed to improve the lives of North Korea's impoverished citizenry. Other research qualifies as truly fundamental science, such as an ongoing study of the volcanic Mount Paektu by North Korean and Western geologists. 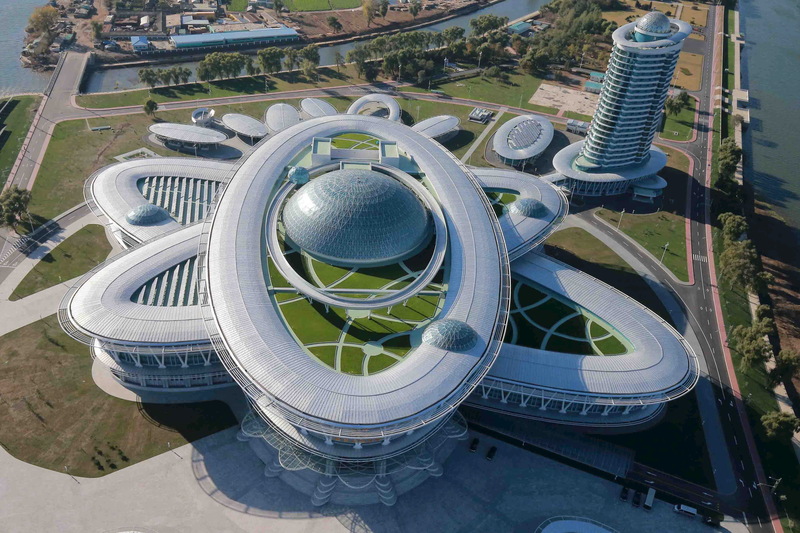 Kim Jong Un has built a new scientific complex in Pyongyang that is shaped like an atom. It serves as a conference center for North Korean researchers. But Pollack, who has examined the abstracts of hundreds of papers published in peer-reviewed scientific journals by North Korean authors, says other research is "dual use" — meaning that it could have military applications and thus should not be allowed. "There are aspects of mathematical modeling that look particularly applicable to missiles and aircraft. There is engineering work that relates to cables that would be used in nuclear reactors. That's pretty clearly dual use," he says. "And my personal favorite is automotive research." Take, for example, a paper titled "Active Steering Control Strategy for Articulated Vehicles," published in a relatively obscure journal in 2016. The paper is a collaboration between a North Korean scientist at Kim Chaek University of Technology in Pyongyang and Chinese researchers at the State Key Laboratory of Automotive Simulation and Control at Jilin University, relatively close to the North Korean border. The paper models the performance of trucks with multiple steerable axles. Such technology, the authors argue, can improve maneuverability, preventing jackknifing and other "key factors leading to fatal traffic accidents." What the authors fail to mention is that active steering is considered completely impractical for commercial trucking. "The steerable axles must be more complicated, heavier and costlier than simple 'solid' nonsteering axles," says Chris Winkler, a research scientist emeritus with the University of Michigan Transportation Research Institute, who specialized in the study of heavy vehicles. "Extra weight can be a major penalty; all commercial trucking operates under the constraint of legal weight limits." While active steering hasn't caught on commercially, there is a place it can be seen: North Korean military parades. North Korea is believed to be developing the technology to build its own heavy trucks. The trucks would be used to carry nuclear missiles. The superheavy 16-wheel trucks carrying North Korea's largest intercontinental ballistic missiles use active steering. Roughly half a dozen trucks were imported illegally from China before Chinese authorities caught on and stopped further shipments, according to a 2013 U.N. report. This paper and several others on topics like production lines for diesel engines suggest that if the North can't get heavy trucks with features like active steering elsewhere, they will try to get the knowledge to build them independently. "It does certainly appear that some of this joint scholarly activity should not have been done," says Elizabeth Rosenberg, a senior fellow with the Center for a New American Security and a former Treasury official who helped oversee North Korean sanctions under the Obama administration. She was not involved with the study. Rosenberg says sanctions have primarily focused on restricting the flow of money and material in and out of the North. But customs enforcement and banking restrictions "are not tools well-suited for getting after the transfer of knowledge from one person to another," she says. Many researchers in the West are heavily vetted by their own governments before they are allowed to collaborate with the North Koreans. "We go through quite a lot of checks to make sure that we comply with all of the international sanctions," says James Hammond, a geophysicist at the Birkbeck University of London who collaborates with North Korean scientists on a study of Mount Paektu, a volcano on North Korea's border with China. It took nearly two years working with the U.S. and U.K. governments to get approval to carry in sensitive seismic equipment needed for their research, he says. But it is unclear whether Chinese researchers are subject to the same scrutiny by their government. One researcher reached by NPR said that the North Koreans came to his lab as part of an agreement with his university. Yongzhou Hu of Zhejiang University collaborated with a North Korean researcher on the synthesis of drugs that are distantly related to nerve agents. He says that the North Korean scientist did not fund the research and didn't gain any intellectual property from the collaboration. At an international level, scientific research is not something widely discussed as an issue when it comes to North Korea, says Rosenberg. Given the independence with which university researchers operate, "it's certainly possible that experts and senior political officials in Beijing are not closely aware of what's going on," she says. Pollack says that scientific cooperation may also be used by the Chinese as part of a broader effort to keep North Korea under its influence. "I suspect that it is Chinese policy to provide access to their researchers and the universities essentially as a sweetener," he says. Rosenberg says she believes the apparent continued collaboration matters, even though North Korea has already developed powerful weapons and missiles. She notes weapons and missiles require constant maintenance and upgrading. "Paying attention to the scholars they have who are coming up in the ranks, who will be the scientists and engineers for them in the years and decades to come, absolutely has relevance for whether or not North Korea is able to sustain their capacity and [will] continue to remain a nuclear threat," she says. But fixing the situation will not be simple. Park, the Harvard neurosurgeon, warns that dual-use research doesn't have to be limited to missiles and bombs. "I'll give you an example: When you study infectious diseases, which are a big burden in North Korea, you have to grow bacteria," he says. "That's the kind of technology that goes into creating biological weapons." If nations get serious about restricting scientific exchange, then governments will have to make hard decisions about allowing research like this, which may benefit public health but also falls into the grayest zones of dual use. "Would you then say to the North Koreans and the Chinese that you cannot do research on things that kill their people?" North Korea is subject to some of the strictest sanctions on the planet. The Trump administration is depending on that pressure to force North Korea to give up its nuclear weapons, but new research shows the North is getting around sanctions. Through science, North Korea could be getting knowledge that the U.S. doesn't want it to have. NPR's Geoff Brumfiel explains. GEOFF BRUMFIEL, BYLINE: Kee Park is a neurosurgeon at Harvard Medical School, and he's one of the few Americans who's actually been to a scientific conference in North Korea. KEE PARK: They have one every year in May. Medical doctors present their research. BRUMFIEL: Park says North Korea's scientists are really clever, and their work helps the isolated nation get things it can't get otherwise. They've developed their own ultrasound machines, built a medical CT scanner from scratch. PARK: They are now manufacturing their own artificial knee implants, and they're implanting them on their own patients, which, to me, is remarkable. BRUMFIEL: The conferences are held in a big building in Pyongyang the North constructed a few years ago. A tribute to the nation's scientists, it's shaped like a giant atom. PARK: And in the middle of the entire atrium is a massive missile (laughter). BRUMFIEL: Actually, it's a rocket, not a missile - a model of the vehicle North Korea used to launch its first satellite. But that's kind of the problem - a rocket looks like a missile. It has a lot of the same parts and does almost exactly the same thing. It's what sanctions experts call a dual-use technology. Now, new research shared exclusively with NPR suggests North Korean scientists have been working on a lot of dual-use technology, and they've been doing it with researchers from other countries. Josh Pollack is with the Middlebury Institute of International Studies and an author on this new research. It reviewed over 1,300 North Korean scientific papers and found a lot more than knee implants. JOSH POLLACK: There are aspects of mathematical modeling that look particularly applicable to missiles and aircraft. There is engineering work that relates to cables that would be used in nuclear reactors. That's pretty clearly dual-use. And my personal favorite is automotive research. BRUMFIEL: Pollack pulls up one of the papers, a collaboration between a North Korean scientist and Chinese researchers. The title sounds fairly innocent. POLLACK: "Active Steering Control Strategy For Articulated Vehicles." BRUMFIEL: As Pollack explains, this paper is basically describing a technology used in very heavy trucks, trucks that can go off-road, for logging operations, say, or for something else. POLLACK: It's nice to have a truck that can carry large missiles and can go off-road and hide. BRUMFIEL: In fact, Pollack has seen trucks with active steering control like what's in the paper. 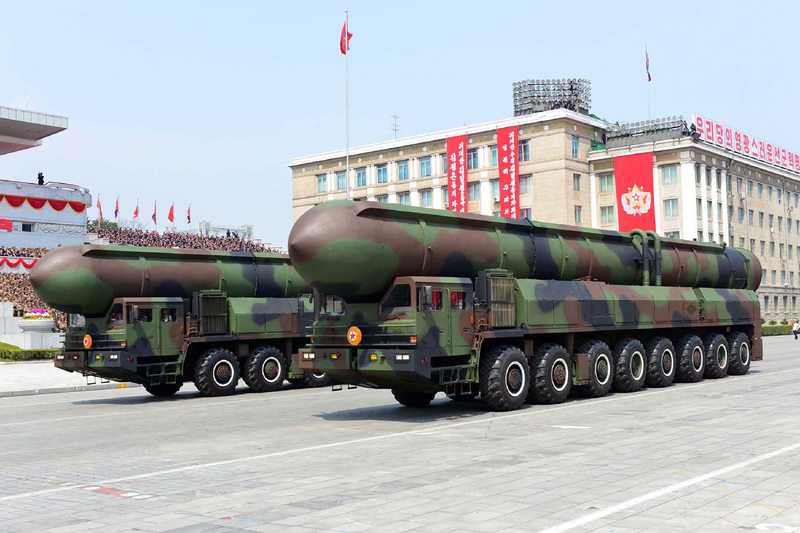 BRUMFIEL: In North Korean military parades, these 16-wheeled trucks are carrying huge intercontinental ballistic missiles, the very missiles the U.S. is insisting the North must give up. Now, these trucks were imported illegally before China caught and stopped shipments. This paper and several others like it indicate that if the North can't import the trucks themselves, then they will obtain the technology to build them. POLLACK: This is, in part, how the North Koreans go about beating sanctions. BRUMFIEL: Pollack and his colleagues say, of those 1,300 papers, most are collaborations with Chinese scientists. About half, they believe, could have dual-use applications, and 100 or so are, quote, "of concern," meaning they need a close look. ELIZABETH ROSENBERG: It does certainly appear that, in fact, some of this joint scholarly activity should not have been done. BRUMFIEL: Elizabeth Rosenberg is with the Center for a New American Security and a former Treasury official who helped oversee North Korean sanctions under the Obama administration. She says that sanctions largely focus on money and materials, not knowledge. Does it matter now that the North has nuclear weapons? ROSENBERG: It absolutely still matters. BRUMFIEL: That's because maintaining and upgrading the missiles and nukes is done by people. ROSENBERG: You need an array of different kind of engineers and scientists and materials experts. PARK: Would you then say to North Koreans and the Chinese, you cannot do research on things that kill their people, you know, infections? BRUMFIEL: Sanctions are designed to target technologies the international community doesn't want North Korea to have. The problem is that the knowledge going into those technologies is often a lot more fuzzy. Geoff Brumfiel, NPR News. (SOUNDBITE OF BREAK OF REALITY'S "OTHER WORLDS") Transcript provided by NPR, Copyright NPR.